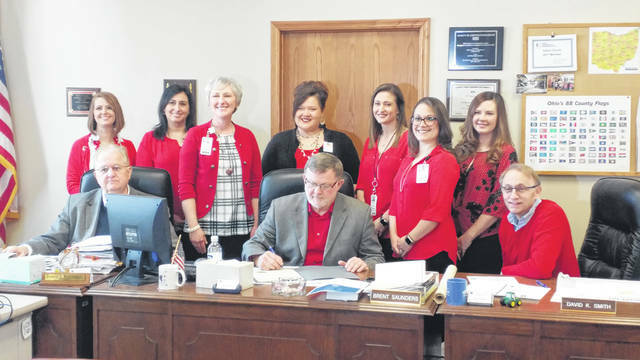 Gallia Commissioners proclaimed February American Heart Month, Thursday, during the regular commissioners’ meeting in the Gallia Courthouse. Holzer Health System cardiovascular health representatives, pictured, celebrated the day with the commissioners’ proclamation. According to CDC.gov, heart disease can happen at any age. Half of all Americans ahve at least one of the three top risk factors for heart disease, smoking, high cholesterol and high blood pressure. Risk can be mitigated by eating healthy, not smoking and regular exercise.